When two countries have huge economic disparities, people from the poorer country often try to immigrate to the wealthier country. And if they can’t enter legally, they try to infiltrate illegally. The Bhagavad-gita highlights the huge disparities between the material world and the spiritual world (08.15-22). Whereas the material world is ephemeral and distressful, the spiritual world is eternal and blissful (08.15). On understanding these disparities, we naturally desire to immigrate to the spiritual world. What is the criterion for legally immigrating there? Pure devotion to Krishna, the Lord of the spiritual world. The spiritual world is the place where everyone lives for Krishna. Only when we develop this Krishna-centered consciousness can we enter there. Otherwise, its borders are foolproof. Does the impossibility of infiltrating into the spiritual world imply that we are unwanted there? Not at all. Krishna has already invited us by expressing his love and longing for us in the Gita. He assures that if we devote ourselves wholeheartedly to him, he will personally lift us from here to there (12.06-07). If Krishna is so eager, why, then, does the spiritual world have the stringent entry criterion of pure devotion? That criterion is meant not to deter us, but to prepare us for relishing the spiritual world. Therein, all happiness centers on loving absorption in Krishna; if we have no love for him, we won’t be happy there. Thus, we need to cultivate pure devotion simply to reciprocate with his invitation. Moreover, Krishna helps us meet the immigration criterion of pure devotion. 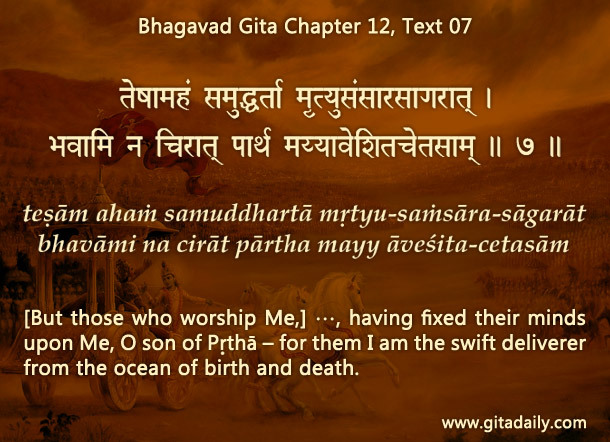 He offers us the time-honored process of bhakti-yoga for redirecting our love from this world to him (12.09). By diligently practicing bhakti, when we love him more than the world, he takes us to his personal abode for a life of eternal joy. How do we get the desire to immigrate to the spiritual world? What is the purpose of strict immigration criterion for the spiritual world? How can we follow through on Krishna’s invitation to immigrate to his abode?